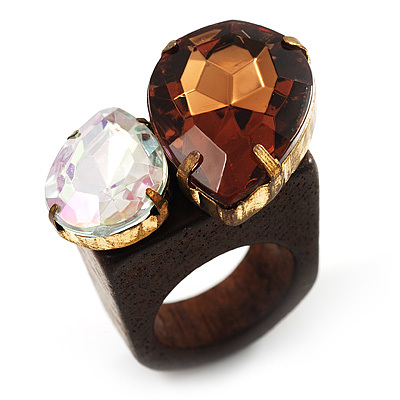 Complete your outfit in style with this gorgeous Acrylic Wooden Boho Style Fashion Ring. Featuring a boho style, crafted from brown-coloured real wood and decorated with teardrop-shaped, faceted amber- and clear acrylic stones claw set in bronze tone frame, offering a unique look. The head of the ring measures about 32mm x 20mm and the shank tapers to about a 8mm band. The perfect ring to show off your manicured nails.